Ember Dean Jones, infant daughter of Tucker and Andi (Kemper) Jones, was born on March 20, 2018 in Shenandoah, Iowa. She was welcomed into Heaven on October 23, 2018 at Omaha, Nebraska at the age of seven months, three days. From the day her parents knew she was going to be a little girl, her name had been decided as Ember, meaning 'Fire of God'. Her mother, Andi and father, Tucker, love fire. And the most beautiful and strongest part of a fire are the embers. If you try to throw water onto a fire to put it out, the embers glow brighter to try and restart the fire. That's what Ember did. She started the fire in her mother and father. Just like the fire embers, she was strong and beautiful. Her mother had decided she was going to tell Ember this someday when she came home from school crying because of bullies, so she would know since day one that she had a strong, beautiful name. 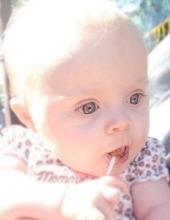 Ember will continue to be the fire in her parents' eyes until they meet again. She was always a very happy baby. The family wishes that Ember is remembered that way and to remember her beautiful smile and glow she had in her eyes. Preceding Ember in death were her great grandparents, Arden Krakow, James Kemper and Gary Williams. Ember will always live on through the hearts of her parents; grandmothers, Stacy Jones, Barbi Kemper, Rose Judy, Lisa Adler and Jamie Jones; her grandfathers, Dave Kemper, Chris Brunner and Mitchel Madron; great grandmothers, Joyce Kemper, Jackie Williams, Becky Jones and Gerry Franz; great grandfathers, Rick Hodge and Bobbie Jones; uncles, Josh Venden, Cory Jones, Jason Venden, Ashton Bright, James Poppa, Sean Kellogg, Josh Farrar and Jess Fall; aunts Cheyenne Jones, Charli Kemper, Caitlyn Jones and Katie Johnson; cousins, Parker Venden, Kinsley Venden, Braydin Venden, Jaydin Venden and Jordan Venden; other relatives and friends. Celebration of life funeral services will be held on Saturday, November 3, 2018 at the Nishna Valley Funeral Home at 2:00 PM with Pastor Rick Sleyster officiating. The family will greet relatives and friends with visitation one hour prior to the service beginning at 1:00 PM Saturday at the funeral home. Memorials are being directed to the family. Celebration of Life Funeral Service.